And, since I love a good character actor, I’ve got a bit of a crush on our Islander guest, actor Richard Herd. He’s been shinning brightly and consistently in films and on TV for decades, literally. His credits, as listed on IMDB, are nothing short of astounding. He’s been shinning brightly and consistently in film and on TV for decades. Richard’s abilities extend far beyond the big and small screen. He writes poetry. He paints pictures. 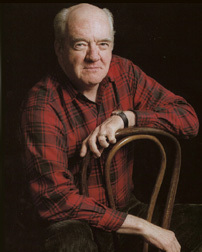 and Richard’s own corner on the Internet, The Official Richard Herd Website. Thank you, Richard, for allowing us to ship you off to our deserted island. Enjoy your BBQ chicken! This entry was posted in The Islander by Nancy Louise Rutherford. Bookmark the permalink.